Crowle Brickworks was established around 1880 by George Robinson, adjacent to his brewery to the north of the railway and canal. As can be seen the clay pits were connected tothe brickworks by a small tramway which was initially operated by horses. The works had a large brick kiln and were mechanised. 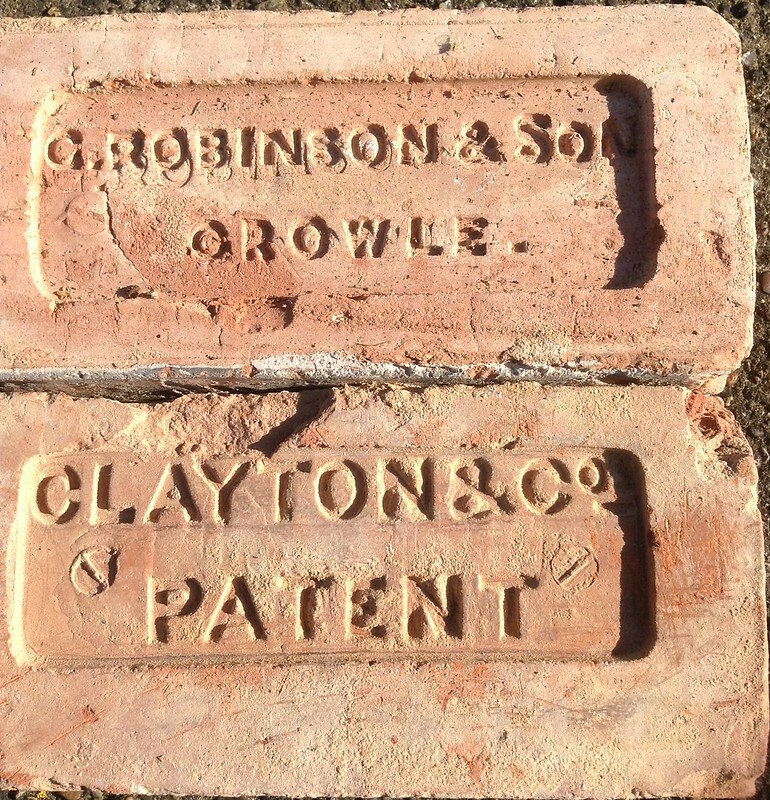 The reverse of the brick has the Clayton & Co Patent. Clayton and co manufactured both brick and tile making machines. In 1895 George Robinson was declared bankrupt,however it was not until 1906 that creditors of George Robinson sell both Tetley Hall and the Brickworks at Auction. The brickworks were bought at Auction by Oaklands Bros., who also operated brickworks in and around Barnsley. The Hull Daily Mail reported in April 1906 that the brickworks would be ready for work in about 2 months and were spending around £5000 on new plant. 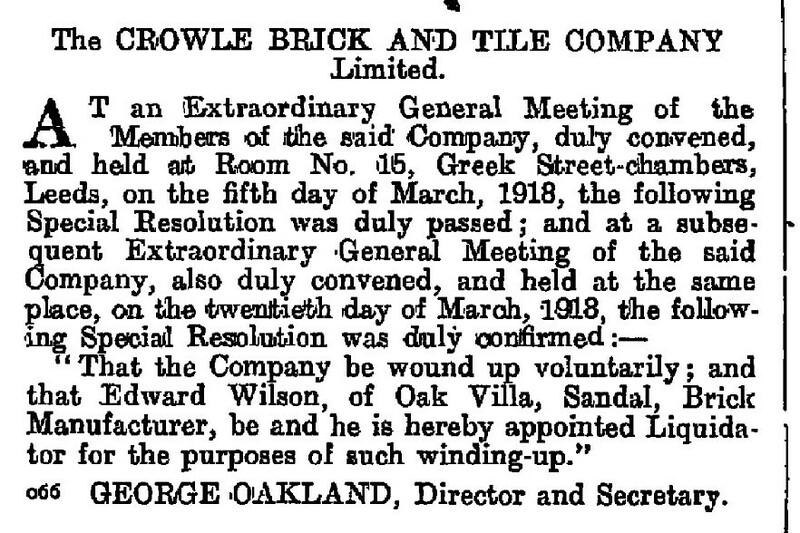 It would appear that during the ownership byOaklands the works became known as the Crowle Brick & Tile Works Co Ltd. However in 1919 the business was voluntarily wound-up by GeorgeOakland. The brickworks were then acquired by the Redbourn Steelworks in Scunthorpe. Bricks were needed to build houses for this rapidly growing industry. Redbourn works in turn was taken over by Richard Thomas. In 1945 the company merged withBaldwins ltd to create Richard Thomas Baldwins. Crowle Brickworks closed in late 1980. At that time it employed around 30 and was part of Innes Lea Industries Ltd.The works manager at closure was Alan Craddock. The site of the brickworks and the associated clay pits are now the Seven Lakes Leisure Park. Crowle Brickworks Loco A loco with works number 1881, was built in 1934 and worked o­n a 1′ 8″ gauge tramway at Crowle Brickworks. It is a Hibberd “Y” type, with a Ford 8hp petrol engine, and fitted with a cab. The line closed in June 1968, replaced by dumpers, and the loco was bought for preservation in October 1970 by Richard Morris of Kent, o­ne of the consortium of enthusiasts who later set up the narrow-gauge collection at Gloddfa Ganol. Mr Morris re-gauged it to 2′ gauge in 1972. The locomotive is now at the Steeple Grange Light Railway near Wirksworth in Derbyshire. Crowle Brickworks sold by BSC in 1972 On the 7th April 1972 the Times reported the sale of some of BSC’s (British Steel Corporation) brickworks. It was revealed that BSC were in advanced negotiations to sell off almost half of its brickmaking facilities. The main deal was with Butterley Brick company of Ripley (Part of the Hanson organisation) who were to buy seven brickworks – Thurcroft at Rotherham and six works operated by the BSC’s strip division. The other sale was being negotiated with a private unquoted company Innes Lee industries of Overton near Wrexham. The deal comprised of four smaller brickworks at Belton and Crowle, near Scunthorpe , within the General Steels division; Bilstorpe near Newark and Campbell at Stavely, near Chesterfield, both part of the corporations tubes division. Submission by Bill Goldthorp A gang of what these days would be descibed as vandals often played around the brickworks in the forties, before what was known as the new clay pit, that belonging to Tetley Hall closed and a fresh pit started near the old potato factory. The odd visit would be made to the works at weekends when it was very satisfactory to run over the drainage pipes in the drying shed, they crumblesd so nicely beneath your boots. The tippimg trucks for the clay would often be left outside the works at the top of the incline into the pit. They could be detached o­ne by o­ne and riden o­n the rails down the incline, gathering speed and often derailing, the skill was to jump clear before the derailmanet occurred. How we avoided serious injury I do not know. The deisel loco was kept locked in a shed, but a new friend related to o­ne of the presonelle at the pit, borrowed the key. We had often watched and assisted our fathers and other farm workers in starting tractors. We started the loco and headed of down the track but derailed that as well. Later, teenagers and perhaps a little more responsible, o­n Saturday afternoons in Summer we headed for the brickworks cricket pitch, invariably the brickworks or their visitors were o­ne or two men short, we always got a game. No o­ne fished the old pit, but when the new pit was closed and fresh o­ne started, they tipped the top soil into the old pit. o­ne day returning from fishing in the canal (we never bought a license), we dangled our bated hooks ih the area where the top soil had been dumped. Within minutes we were pulling out massive perch and roach, big enough to take home for tea. The old pit became our favourite fishing ground, but we could not keep our mouths closed, so it became everyone elses as well. Name and address not supplied. 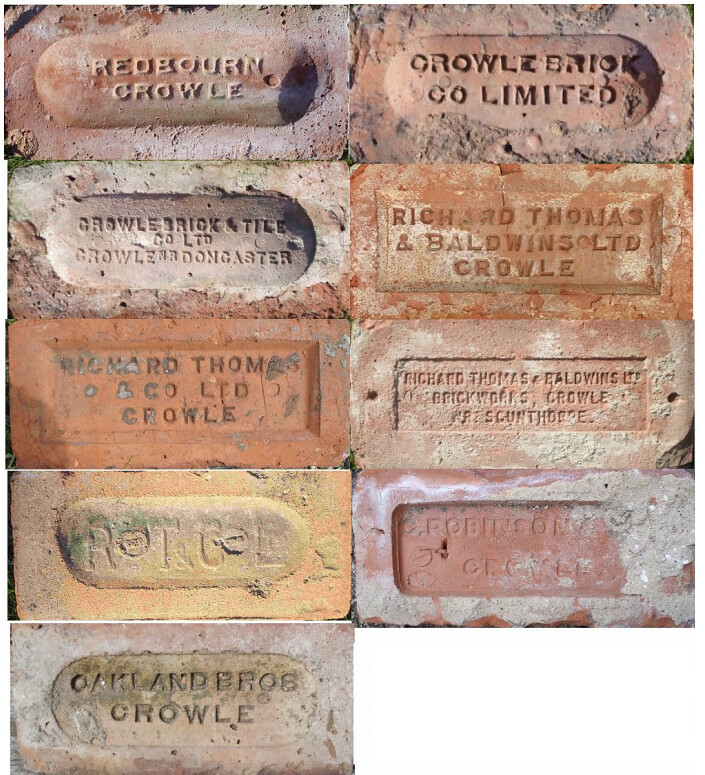 I was led to believe that a mr Clark owned Crowle brick works at some point around the early 1900’s but I cant see any mention of his name. Unfortunately I don’t know his first name. all I know is that they lived in Crowle and his son Douglas was killed in a Hampden plane crash on 1st aug 1941 in lincolnshire. They also had a daughter called Grace. I’m sorry I have not come across that name in relation to the brickworks – it is possible that he was a manager of the brickworks. Do you have any more information about him and the dates he was in Crowle? I’ll see if I can cross check him with other records. The cult film – Get Carter by Ted Lewis, is set in Newcastle on Tyne. I read the book in the late 60’s, long before ever seeing the film. I remember thinking that the story was set in and around Scunthorpe, although the actual location is never, to my knowledge mentioned. In the book, Carter meets his end at the knife of the Driver/Minder in the film played by Iain Hendrey. In my mind and at the time, I had brick kilns located in Asnbyville – to the East of Sunny Scunny. I lived there from early 50’s to mid 60’s and so much fits. The book has no mentions at all of big car parks or shoot outs on ferries, so Newcastle is obviously a “non – runner. ( correct spelling) Oakland. You show that Oaklands bought the brickworks and I am beginning to see connections between the Ansell family, the Oakland family and Crowle. Thank you.